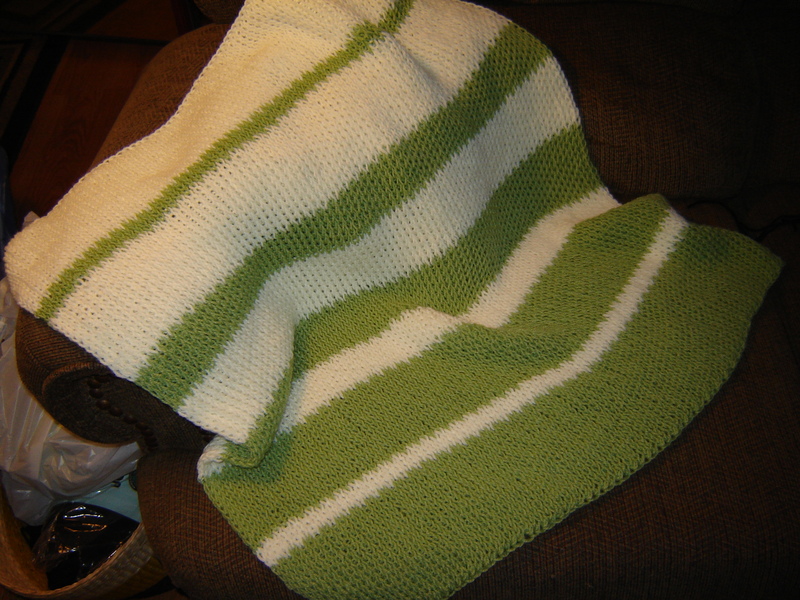 Knitting Board made Baby Blanket…amazing! Yes…I have been busy again! The last time was because of the birthday’s in my family (note: they both loved them!!) but I have a new motivation this time…reproduction. First off, and I think that this is important for the context of this entry…I do not have children of my own. I have two step children but they were both teenagers when I came into the picture so it really doesn’t count. I have never experienced morning sickness. I have never experienced a ravenous appetite for weird things without explanation as to why (I had a friend, long ago, that craved night crawler dirt when she was preggers…she would stop at bait stores all over the place to just smell, not eat, night crawler dirt…very odd). I have never given birth to anything. I have, however, experienced something similar to labor pains. I had a kidney stone a few years ago and yes; I was pleading with the nurse to make the pain stop (I saw it done in those birthing shows on the Discovery Channel and it seemed to work for them so I gave it a try…), thank God she was sympathetic to my situation! As she was launching me into a blissful “full body buzz” via IV happy juice, she asked me if I’d ever had children. I said no. She smiled and said, and I quote…”A kidney stone is the closest thing you will experience similar to labor pains if you’ve have never experienced a vaginal birth”. Needless to say, I have great sympathy for any woman that would willingly put themselves through it in the first place. So, why am I making a baby blanket? Well…because many people that I know ARE. They have decided to (or conceded to the idea of it happening…) bring forth another human being into the world. On very few occasions, in my life, I have experienced the fleeting need/want to have, and keep, children. Needless to say, it eventually passed. In all honesty and seriousness, I have a very clear view of the horrors that are in this world so maybe, somewhere deep in my subconscious, the mental switch prevented the physical act of creating a baby or maybe God understands that I had a different destiny lined up for me other then to change poopie diapers and cut me a little slack. Since my sister ended up having “My” daughter that I was cursed to have (“you’ll be sorry when you have one just like you!! ); I’m okay with the way things turned out. I think making baby blankets is sort of my way of being sympathetic to the process of babies getting here and that I sort of skirted the whole thing. From the outside looking in, the whole process seems rather…harsh. My hubby works with one of our friends that’s due in about 3 months. A few weeks ago he came home saying that I needed to come and see her because “the turkey thermometer popped”. I found out soon after, as I saw her in her complete misery (my sister is the only woman I’ve ever seen “glow” when pregnant) her belly button had become VERY outwardly present and poked out prominently from her uniform. She was miserable in a very public way and I feel bad for her…her blanket is almost done. As for how I happened upon this miracle of yarn craft; sometime this past winter, I decided to watch HSN (home shopping network) because it was “Craft Month” and was desperate for something to watch on a Tuesday afternoon. They were highlighting an item called a “knitting board” (2 boards; scarf and baby blanket sized…). I’ve been knitting and crocheting for a long time and never even heard of it before. Since I normally get my best crafting idea’s from obscure TV shows, I was intrigued! Apparently, as the completely fake and plasticized hostess would go onto explain…(this chick had no clue as to what this thing did or was used for…she was as worthless as the hosts/hostesses that just hold the guitars when ESTABAN is on hocking his cheap guitars all while playing barely recognizable songs and they’re trying to look interested…nobody can smile that long!! 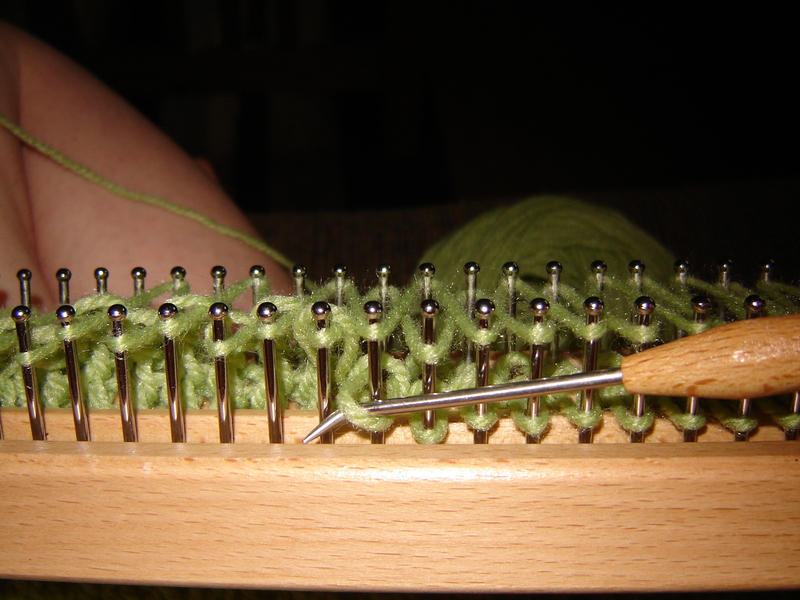 )…that knitting needles were actually the upgrade to the knitting board due to the ease of transportation. 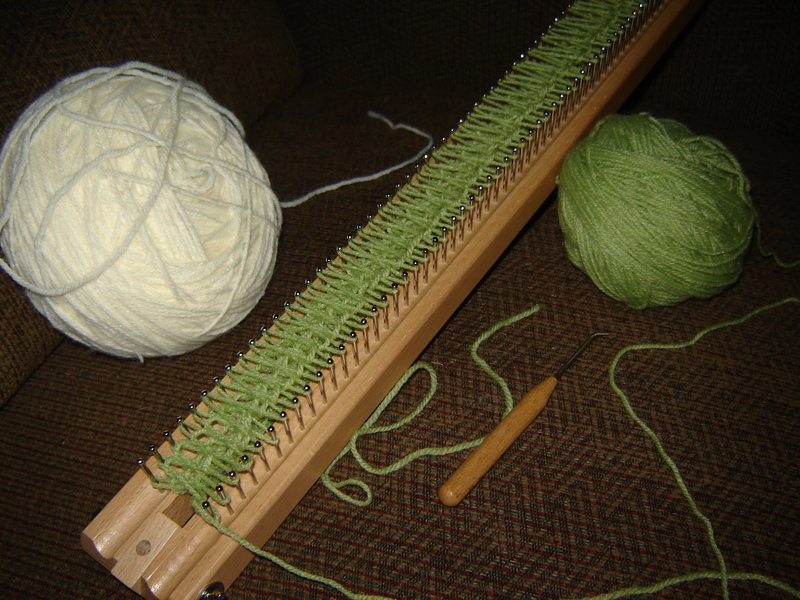 Thus, the knitting board fell to the way side and became a lost art somewhere around the time where being a Quaker in the US wasn’t mandatory. However, due to the unique “double knit” result of this technique, there has recently been a resurgence in popularity within the crafting community. Blah blah blah and the plastic lady was starting to piss me off. However, when they showed the finished product I had to buy both of them!! It’s rather simple to do. 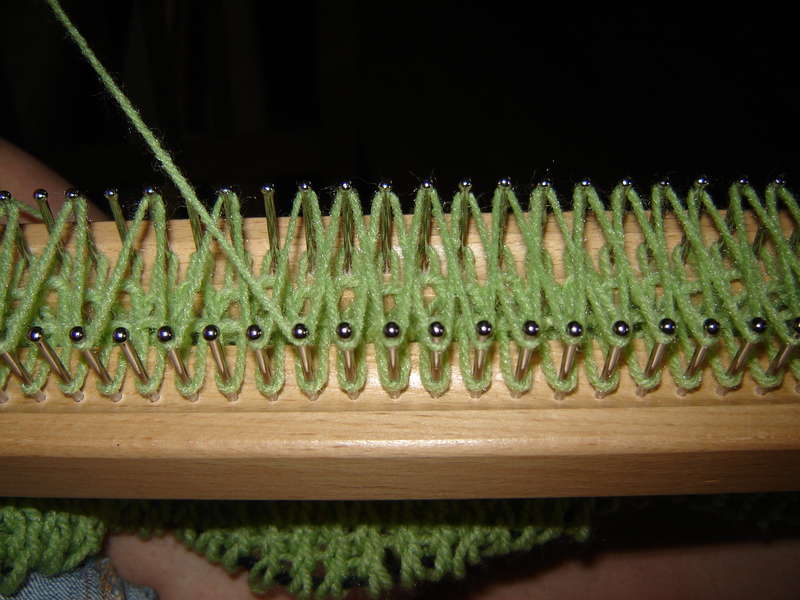 You zig zag the yarn and flip the bottom stitch over the top stitch that was just put on. Changing colors is really easy too! When you’re done, you just crochet the very first row and the very last row so the whole thing doesn’t come unraveled. But, there is an amazing aspect to this blanket!! It’s as fluffy as a bag of cotton balls!! 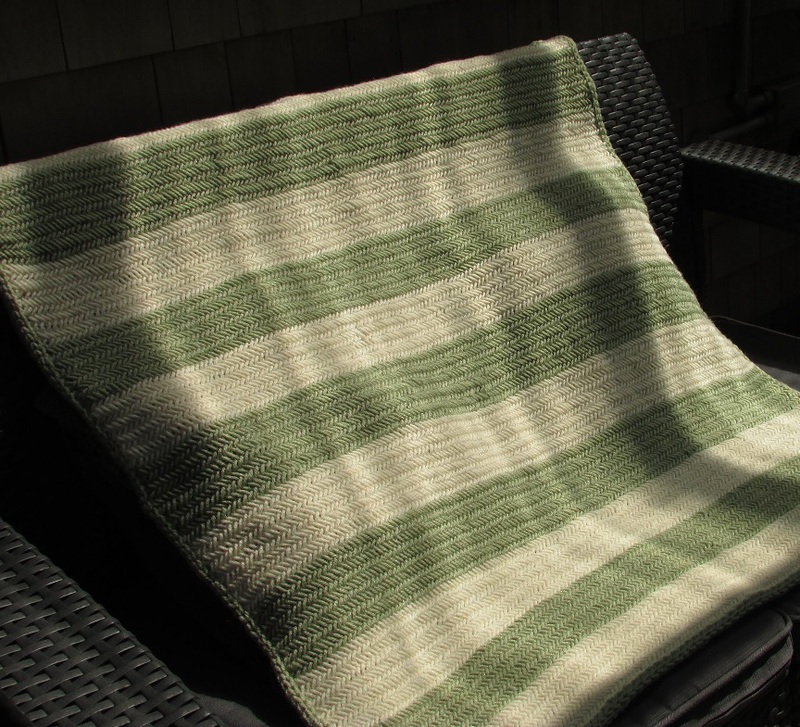 The double sided knit creates a fabric that is nothing short of luxuriously soft and light! It’s so fluffy that it fluffs to about 1/2 thick but compresses to nothing if you pinch it lightly. If it gets a snag, you just yank on it and it goes back into shape. I almost wish I had the patience to create a whole afghan with it…but I don’t and it would take too long to do and then I wouldn’t be able to blog about the projects I make because a king sized afghan would take way too freakin’ long to do (plus it got up to 87 degrees today and the LAST thing I want to do is bury myself under “pile o’ yarn” for the sake of a winter project). I wish blogs could be touch sensitive because words can’t describe how amazing this thing feels. I’ve made 20 some-odd baby blankets but this is my second on the knitting board. Anyway, I hope you enjoyed my latest entry!!! Thank you for all of the hits!! !